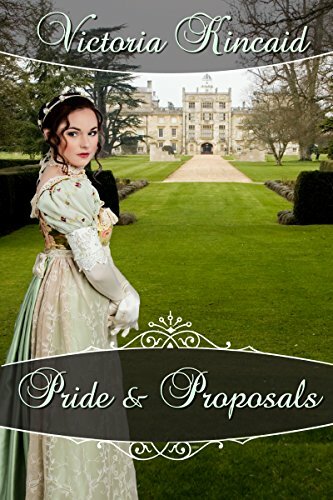 I read Pride and Proposals shortly after it came out in 2015 but never reviewed it because it was a pre-blog read, so when I saw that it had come out in Audible, and that the narrator was Erin Evans-Walker I decided it was time to come back to this story and these characters. I’m currently not listening as many audiobooks as I used to because I’m sharing the commutes with my husband and I don’t want to neglect him during the 50 minute drive, but I still try to listen to audiobooks when I’m doing chores or cooking. Audiobooks make these tasks more pleasurable and keep me company so I will not give them up that easily. But the fact that I’m listening to fewer audiobooks makes me more selective, and I’m choosing the narrators very carefully now, taking them as much in consideration as I do the authors. Having listened to The Meryton Murders narrated by Erin Evans-Walker made me confident that I would like this narration and I was not wrong. Erin Evans-Walker was the perfect narrator for The Meryton Murders, she was particularly good at narrating a mystery book and that makes me want to hear The Highbury Murders too, even if I’m not much of an Emma fan. Narrators can either make it or break it, and Erin Evans-Walker is certainly talented, particularly in that sub-genre, so I’m convinced to give it a try. But coming back to Pride and Proposals, I believe she has made a very good job and if you do decide to listen to this audiobook you will not regret it. I believe she is more suited for mystery stories, but she was able to differentiate the male and female voices very well, she varies the tone and keeps the readers engaged in the story which is one of the most important aspects of a narration in my opinion. The narration of Pride and Proposals was very agreeable and I will certainly continue to listen to books narrated by Erin Evans-Walker. I absolutely loved Darcy in this story, he was a true gentleman! He was so caring, protective, understanding and respectful that even I felt bad for all he suffered. He did deserve the ending and I only wished for it to have come sooner for him. Wickham was a real villain and he also deserved the ending he had, I really enjoyed seeing what Elizabeth did to him, and the reactions that followed were very diverting. Victoria Kincaid is a very good writer and was able to make that particular scene very funny. Despite the context I really laugh out loud and I believe that was also because of the way Erin Evans-Walker narrated this scene. Very well done! I recommend this book to readers who enjoy a little angst like myself, and who are not bothered by the fact that Elizabeth gets engaged to someone before Darcy. I believe it is important to mention that nothing improper happens between her and her first betrothed, so do not let that influence you. Darcy’s love for Elizabeth is very pure in this book and they do spend a lot of time together, so readers who like Darcy and Elizabeth moments may enjoy this book too. Your books are always amazing. Hi Amy, Thank you and good luck with the giveaway! I loved this book when I read it but I did cry a bit! Hi Sheila, This one probably has more angst in it than any of my other books! Good luck with the giveaway! I just finished listening to this and it was great. I love audiobooks as I have a rather lengthy commute so it’s so nice to get some of my “reading” done while I sit in traffic. I love audiobooks in the car as well! Good luck with the giveaway. Hi Rita, Thank you for your lovely review of Pride and Proposals! I’m so glad you enjoyed it! Thanks for the chance to win an audio book of the story. Hi Pam, I prefer to have Darcy suffer. 🙂 Good luck with the giveaway! I love audio books! I don’t think I’m familiar with that narrator though. Hi Maria, Erin does a great job! Good luck with the giveaway. An amazing tale to listen to on my daily commute – what a great way to start the day! Hi Virginia, I love to listen to audiobooks in the car too! I don’t do audio books as I prefer to read at my own pace and often re read passages. So, please don’t enter me in the giveaway. I haven’t read this book yet as I hate the thought of Elizabeth betrothed to anyone else. However it is on my list so maybe one day. Hi Glynis, I do prefer print books, but audio can be really handy in the car. Don’t worry about the engagement — E and D have a happily ever after! I am intrigued in your review and Sheila’s comment. Thank you the chance in this giveaway. Hi Shelley, I’m glad you’re intrigued and good luck with the giveaway! I read this book when it first came out, but now i want to read it again! (In fact, I went right to Amazon and borrowed it with KU). I haven’t listened to anything Erin Evans-Walker has narrated, but I love audio books. I listen to literally 100s per year. I work in IT, in a windowless room all alone (seriously. At least it isn’t a basement!) I listen to audios all day during work and during my commute. They keep me sane. Hi Audrey, Audiobooks are so useful when you’re driiving, aren’t they? Yes! Or cleaning, or knitting, or walking, or…. I have to agree with you : audiobooks are my best friends when is chores time. Hi Carla, Yes, indeed! Good luck with the giveaway! I think that the plot of this book sounds wonderful. Colonel Fitzwilliam has always said that he could not marry Elizabeth and now he can. What does happen? How does Elizabeth realize that Darcy suits her more and what will Colonel Fitzwilliam do? I enjoy audiobooks as I do chores and it especially motivates me to walk! Victoria Kincaid is a fabulous writer, and I do relisten to the JAFF audiobooks that I have. Hi Eva, I’m so happy to hear you enjoy my writing! Good luck with the giveaway. I will add this one to my TBR list. I love Victoria Kincaid and look forward to trying the audio version, although I prefer to read the book myself mostly. Hi Sharon, I’m so happy to hear that you enjoy my writing! Good luck with the giveaway. I gave the Kindle edition five stars — I’m looking forward to trying the Audible version. I like to listen to audiobooks when I’m hiking, doing chores, etc. Often I get a different perspective on the book when I’m listening to it. Thanks! Hi Betsy, Thank you for that review! I agree that audiobooks can give you a different perspective on the story. Love this story and love audio. Win Win! I do not know if I have read this type of plot twist where Elizabeth is engaged to someone other than Darcy. I’m not sure if I like to see Darcy suffer like that and more so as his rival is his own cousin and good friend. I hope all will be resolved and D&E get together in the end.